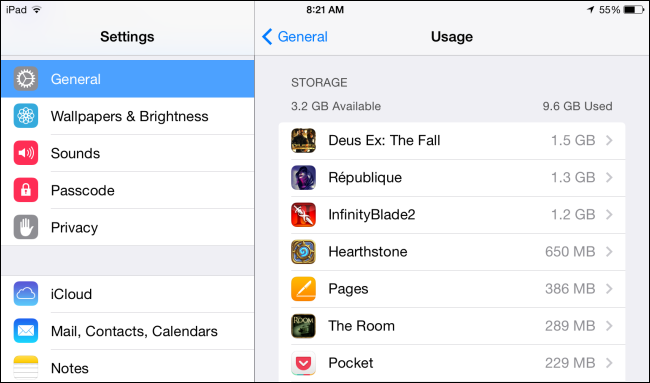 Music, videos and pictures will make the iPhone or iPad storage memory run out of spaces. We all feel the need to clear some extra memory space on our phones, but all the pictures are there to be cherished and all the music to be heard. Maybe that movie can be deleted but before we tap on the click button. But our iPhone 6 are cramped with other documents and data which are compromising with the performance of our iPhone and that must be deleted. There are a ton of unwanted documents that come along in the shape of stock apps, third-party apps, cached data and iCloud documents. These are better to delete. Many apps come in small sizes, but the document and data that come along with it take up more space than the actual app. These memory caches can be cleared. Go to settings and find “Clear Documents Files” and this will remove any offline copies downloaded articles taking up precious memory space on your iPhone/iPad. You can also delete the app completely and reinstall it and delete the other data that comes attached within the app itself. It probably sounds like a lot of hassle, but something needs to be done. Somehow this task is just like cleaning out your wardrobe. There could also be third-party apps taking up space without your knowledge. The thing is, today there is an app for everything available on app stores. You can download apps like Wondershare, PhoneClean or iExplorer to clear out documents and data not needed. Because clicking a few buttons is a huge task. If the iWork apps on your iPhone/iPad are used on a daily basis then this is for you. Under Pages, Number etc there are a lot of apps taking up space needlessly. You can delete these simply by following this path. Setting> iCloud> Storage & Back-up> Manage Store > Documents and Data. Find the Edit button and click it and hit “Delete All”. This will create a ton of space in your iPhone/iPad instantly. You can also delete some old conversations and new unhappy conversations to free some space. If you are an avid gamer and you have a lot of games installed on your phone, you ought to know these take up a considerable amount of memory space since they are pretty large in size. You can delete games you don’t play anymore and any games that are too big and have compromised the performance of your iPhone/iPad, are also advised to be trashed. These apps can always be reinstalled if you miss them too much. Simply find them on the app store. i am old and have memory problems. I need to change all my passwords to something I can remember in order to purchase books.